What would you do, sir, if terrorists were killing 45,000 people every year in this country? Well, the current health care system, the insurance companies, and those who support them are doing just that. ... Those fighting health care reform – not those debating its shape or its nuance – people who demand the status quo, they are killing 45,000 Americans a year. 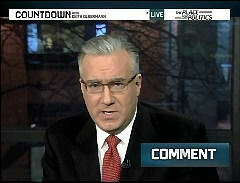 Olbermann concluded by comparing ObamaCare opponents to terrorists: "Because they die individually of disease and not disaster, Neil Boortz and those who ape him in office and out, approve their deaths, all 45,000 of them – a year – in America. Remind me again, who are the terrorists?" As previously documented by the NewsBuster Brent Baker, the CBS Evening News and ABC’s World News have both promoted the same report as a "Harvard study," although, as recounted by Baker, it "was really produced by the Physicians for a National Health Program (PNHP), a left-wing advocacy group which touts itself as ‘the only national physician organization in the United States dedicated exclusively to implementing a single-payer national health program.’ Study co-author Dr. Steffie Woolhandler of PNHP is one of five signers of an ‘Open Letter to President Obama to Support Single-Payer Health Care.’"
"ObamaCare will do more damage," he said, "than a successful terrorist bombing of an airliner and kill more people as well." So, rather than count how many things are wrong with that statement or how many times Neil Boortz must have been abused for him to wind up so dehumanized as to say such a thing, let us answer it on his terms. What would you do, sir, if terrorists were killing 45,000 people every year in this country? Well, the current health care system, the insurance companies, and those who support them are doing just that. Let's frame this in language even conservatives can understand: Those fighting health care reform – not those debating its shape or its nuance – people who demand the status quo, they are killing 45,000 Americans a year. If they were killed all at once or even a hundred at a time, Neil Boortz would be demanding martial law and government by the generals. Instead, because they die individually of disease and not disaster, Neil Boortz and those who ape him in office and out, approve their deaths, all 45,000 of them – a year – in America. Remind me again, who are the terrorists?